A year after GoFundMe acquired CrowdRise, the new CrowdRise by GoFundMe combines and builds upon the strengths of both GoFundMe, the world’s largest social fundraising platform, and CrowdRise, a powerhouse in the nonprofit fundraising space. The reason behind the newly rebuilt and rethought CrowdRise by GoFundMe? Simply put…nonprofit growth. We wanted to make sure that the UI, functionality, and features were carefully designed and built with a heavy emphasis on nonprofit success and growth making it faster, easier, and more efficient for NPOs to successfully fundraise. For nonprofits using CrowdRise, you’re now able to use the newly designed self-service platform to expand and grow your nonprofits awareness, reach, and donation volume. Want to know some best practice tips for getting the most out of the all-new CrowdRise by GoFundMe? Here are our top five. CrowdRise by GoFundMe now has seamlessly integrated ticketing and registration capabilities allowing you to power any type of event, whether large or small, as well as individual or team fundraising functionality. When you leverage ticket and registration, you not only save costs by not using another platform to power these functions, but you also improve efficiency. Now you have supporters registering for your event on the platform where they’ll be donating or raising money, which, in turn, provides them with seamless opportunities to start fundraisers, share their ticket purchase, immediately donate, and more. Social fundraising, or the act of getting people (supporters, donors, evangelists, fundraisers, etc.) to post about the actions that they take related to your cause, is an imperative part of any nonprofits fundraising efforts. Social Amp is our optimized set of campaign features designed to promote sharing and bring in new donations. When the world lives and gives via social media, layering social fundraising onto everything you’re doing allows you to expand not only your reach, but gain more donors, and new supporters. Your supporters have networks that are almost impossible to tap into on your own so using our integrated social sharing features helps to bridge that gap and open up new reservoirs of giving and awareness. When you’re using multiple spreadsheets, running various reports, and housing valuable data in more than one place, it can become a time consuming and tedious task to make sense of it all. Our 100% PCI Level 1 compliant advanced report center allows you to house all of your sensitive donor data as well as seamlessly integrates with the world’s top CRMs such as Salesforce, Raiser’s Edge, and Kindful. Additionally, it comes with new reporting features like scheduled and saved reporting designed to save you time and allow you to leverage your data in a more meaningful way. With our focus on being more self-serve, organizers are able to do more customizations, branding, and campaign configuration allowing you to have complete control over your campaign. You can launch a new campaign in a matter of minutes, duplicate a campaign, or toggle between an individual fundraiser or a team fundraiser with the click of a button. This opens you up to be able to use our specialized success team for, well, success, versus helping you upload an image or change a button color. Our highly-trained success team is waiting to give you ideas on how you can grow and expand your nonprofit in order to reach more donors and gain more supporters. The all-new CrowdRise by GoFundMe was built with multiple campaign types in mind. You don’t have to jump from platform to platform to fit all of your various campaign needs. Now you’re able to expand your campaigns, running one, two, or all of them simultaneously. From donation campaigns, fundraising campaigns, single and multi-team events, with our flexible campaign page design, in just a few clicks, you can have all of your campaigns up and running. Not to mention, you can also have the ability to grow an event with team management and gamification functionality like leaderboards. 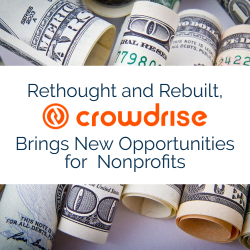 With growth in mind, the redesign and corresponding feature set we built into the new CrowdRise by GoFundMe makes growing, organizing, and running your nonprofit’s campaigns easy and efficient as well as gives supporters a user experience that allows for an unparamount experience with your nonprofit. See for yourself – Take the tour. developing individuals to effectively consult and help nonprofits. Social Fundraising: Are we getting it all wrong?